Birmingham City are out of the Women's Champions League after Cristiana Girelli's hat-trick saw Verona win 3-0 and overturn a 2-0 first-leg deficit. Girelli scored a first-half penalty, then fired home in the 79th minute to force extra-time before netting the winner from a free-kick. 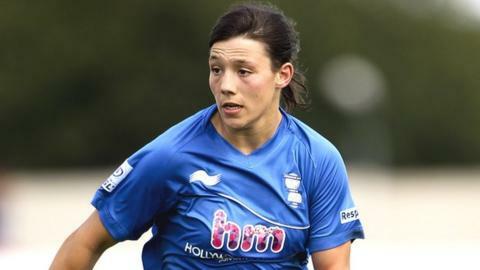 Rachel Williams missed two good chances for Birmingham in the last-32 clash. Josanne Potter hit the post for the visitors and Emily Westwood struck the bar, but they were to be frustrated. Defeat was tough to take for the visitors, making their debut in the competition this season after qualifying by finishing second in the Women's Super League. David Parker's side had looked value for their two-goal cushion both before and after Girelli's penalty, which was Verona's first on-target shot of the match. This season's Women's Champions League final will be held at Stamford Bridge on 23 May, 2013. The defending champions are Lyon. The striker tucked home her 37th minute spot-kick after being brought down by central defender Westwood, who was booked for the offence. Birmingham hit back, but striker Williams shot wide from a good position four minutes before the break. Right winger Isobel Christiansen had a long-range drive superbly saved by goalkeeper Stephanie Ohrstrom a minute into the second half as the visitors showed their intent. Potter was desperately unlucky in the 57th minute when her powerfully struck free-kick thudded off the post. Ohrstrom had to keep out a firm header by Williams before the striker squandered another good opening in the 66th minute. Then Westwood almost made up for conceding the first-half penalty, hitting the bar as she tried to turn a Karen Carney free-kick into the net. But Girelli fired home her second of the night in the 79th minute before Birmingham captain Laura Bassett had to clear a Silvia Toselli shot off the line. Verona began to get the upper hand as play went into extra-time and Girelli almost claimed her hat-trick goal with a 101st minute shot that hit the woodwork. The striker only had to wait a further 11 minutes, however, driving in a 20-yard free-kick to end Blues' first venture into Europe at the first hurdle.